Easter Seals Walk with Me is a fun, family walk that may be short on mileage, but big on the heart. You'll see if you walk with me! 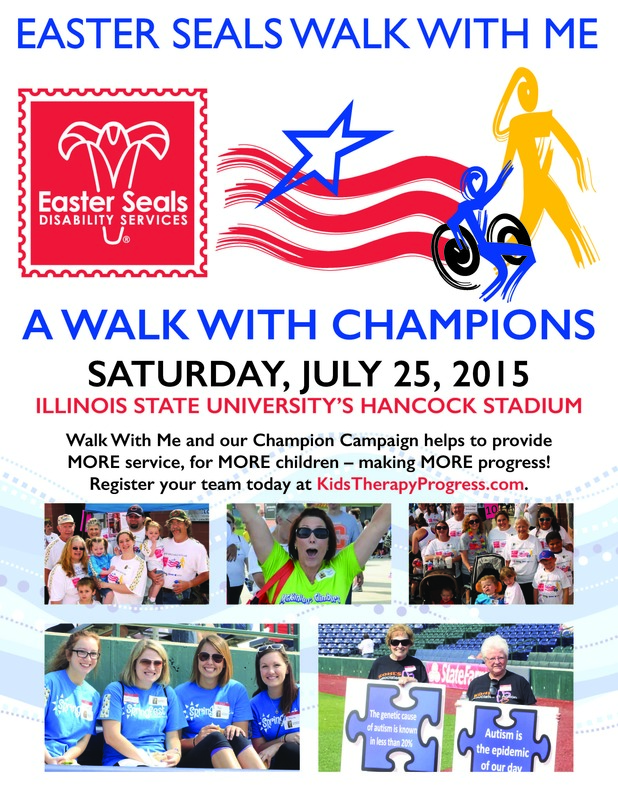 Every walker is teamed with a "Champion" - a local child with a disability who currently benefits or has benefited from Easter Seals services. All proceeds raised locally will benefit Easter Seals programs and services right here in our community to offer help and hope for children with disabilities and their families. You can Walk With Us - Fleet Feet has a team. Click here to join our team! Anyone who donates an additional $25 above the $25 registration fee will earn a Fleet Feet Technical Tee. Email Julie (julie@fleetfeetbloomington.com) after you register to let her know your tech shirt size. Members of our team can pick up their packets early at the store on Friday, July 24 before the event. The walk ends at the south end of the field where participants can go directly to the post walk area and enjoy games, food, bounce houses and plenty of more fun! Thank you for opening your heart and lacing up your walking shoes. You are helping make milestones happen for Easter Seals kids.